Indonesia Fashion Week (IFW) 2017 becomes the momentum for clothing brands to launch their best collection of the season, including Bokitta. Bokitta is a contemporary hijab and Muslim clothing brand based in Beirut Lebanon. It is known for its instant pin-less wrapped hijabs which are suitable for women who want it quick and simple yet still look chic. Bokitta decided that IFW 2017 was the perfect time to introduce their products in Indonesia, and the fact that Indonesia is the largest Muslim country in the world makes it perfect as Bokitta’s next market target. At their fashion show during the IFW 2017, Bokitta released 12 printed hijabs. Bokitta made a smart marketing move by adjusting the hijab designs to Indonesian culture, making it easier for the people to welcome it. Bokitta offers a modern type of hijab that is easy to wear and pin-less. This kind of hijab is perfect for the new hijabis or working women who don’t want to spend a long time on morning hijab routines. Even though they’re easy-to-wear hijabs, Bokitta’s print designers make sure that the hijabs don't look any less elegant on the wearers. They offer various patterns, colors, and styles so the consumers can adjust to their own fashion personality. This also makes Bokitta more flexible in reaching a wider market. Modest.id (MI) talked to Nader Dalbani (ND) as the Business Development Director of Bokitta about the brand and how it’s attracting the Indonesian market. MI: First of all, can you tell me more about what is Bokitta and what is so special about it? ND: The word Boktita comes from the word bouquet (of flowers). We specialize in making instant, pin-free hijabs for women. It’s strapped, but without any pins. We have 4 different types of product: Voila!, Voila!Maxi, Chic!, and Chic!Maxi. There are the short ones and the maxi ones that cover the chest. Our products are 100% cotton in the lining. For the outside, we use different fabrics like polyester, satin, silk, and chiffon. The pantone of colors that we use is the colors of the season. Our prints are handmade by our designers. We have patented products, so no one can do it except us. Our products are for the practical working women. So if someone wants to go to work, she wants something easy. Just put it on and go out, no need to spend time wrapping it, searching for pins, the pins falling down, etc. It’s just like you’re wearing a t-shirt; you can wear it as easy as wearing a t-shirt. We introduced our products for the first time in Lebanon; we are a company based in Lebanon by root. Our largest market is in Malaysia; we have about 23 stores in Malaysia. We also have stores in Brunei and Singapore, and this is our first time in Indonesia. We’re looking for franchises and distributors to sell our products here in Indonesia. MI: Why did you choose Indonesia as your next market? ND: It’s the largest Muslim country in the world, and our hijabs are for the Muslim women so this is the best market for our hijab. MI: And you chose Indonesia Fashion Week 2017 as the momentum. ND: Exactly. It’s our platform to launch our products. We had our fashion show on February 3rd and we got very good feedback from everyone after the fashion show: everyone came to the booth, we had several interviews with other media, many people came to us and they wanted to distribute our products in Indonesia. Alhamdulillah, things are going well. MI: How do you see Indonesian market for Muslim fashion in general? ND: From what we saw in this event and from the fashion shows, it’s one of the best markets. Indonesian people are very elegant, very fashionable, they like fashion, they like colors, they dress elegantly. So our hijabs complement that attire and especially that we’re following the latest trends. So if a woman buys a blouse from, let’s say, Zara or Mango, she can easily find the hijab that goes with it. Similar with the opposite when they buy the hijab and then they go to Mango and Zara to find the rest of the outfit. Because the first thing that one sees is your face, so if you have something beautiful on it then that’s the best thing. ma.na, wajah baru dari label kerudung dan aksesori hijab yang sebelumnya bernama Square. Let's unveil their first collection. 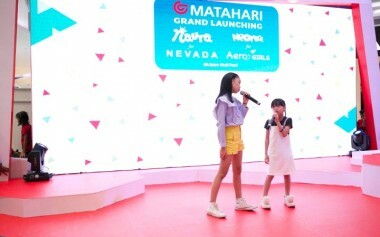 Ada Apa Saja di LC Waikiki Store Gandaria City? 01. Fatih Seferagic Indonesia Tour! !